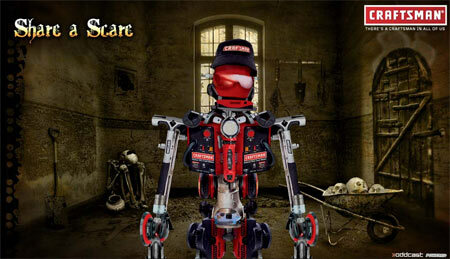 None of the traditional holiday email-o-grams get me, but Craftsman’s “Share a Scare” is pretty amusing. Sure, it’s also a way to capture your email, but at least it gives you something else to do at the office instead of working. If you’re eager to make the robot deliver a very “special” Halloween message to your friends and co-workers, we hate to break it to you that this one isn’t “George Carlin”-friendly. Most of the nasty words have been disabled — ahem, or so we hear. If you un-check the “I would like to receive updates” box when you send an ecard, you’ll stay off the mailing list. You can also post directly to facebook or get embed code for blogs and MySpace. You can make it say anything if you spell it right, as in don’t spell it correctly, spell it phonetically with each word being a syllable. gotta admit the music is kinda creepy, reminds me of eerie 70’s horror music. Pretty cool site, like the wallpaper.